6.0 (Geometry series) – Subtle movements with all the steering ratio features, for wheels only. 6.1 (Geometry series) – Moderate movements with all the steering ratio features, for wheels only. 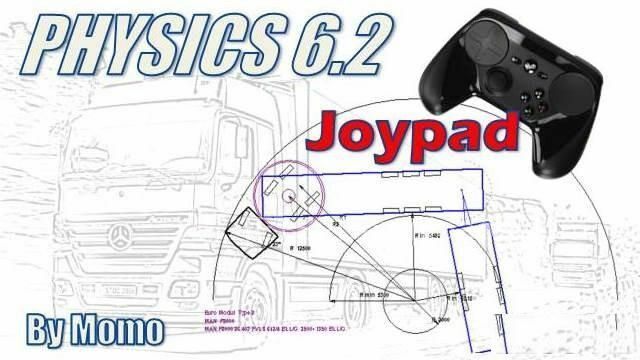 6.2 (Joypad Friendly) – A clone of 6.1 but without the steering ratio features. For both joypads and wheels. 6.3 (Active series) – Max movements with all the steering ratio features, for wheels only. 6.3 (Joypad Friendly) – A clone of 6.3 but without the steering ratio features. For both joypads and wheels. Note: From 6.x versions onward, the seat suspension is not included but available separately. 3. (Recommended for 900 degree wheels) Steering sensitivity 50%, Steering Non Linearity 75%. 4. This mod must be higher than any truck mods, and any mod related to the trucks. 5. (Optional) For realistic feel of the speed, type “warp 0.85″(default is 1.0) in the console command (without the ” “) for FOV 80 degrees. The speed will be equal to real life. – Compatible with game patch 1.31.x and all DLCs. – (Very rare) Some engine mods may conflict with this mod.